Tucson Daily Photo ~: Tuesday is Tucson Trivia Day! 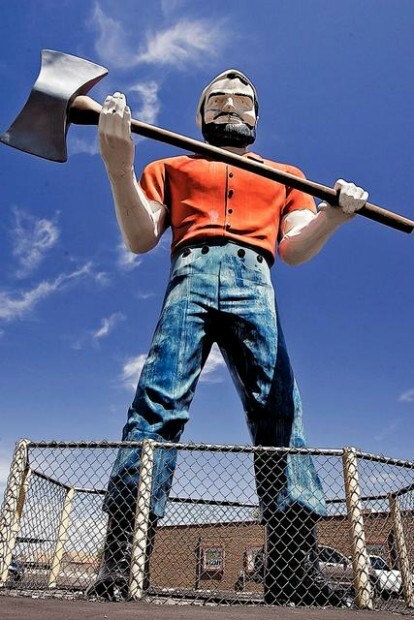 Do you know how long Tucson's own Paul Bunyan has been holding up his ax? Since 1964! He has been guarding the corner of Glenn and Stone for decades! Occasionally his ax is swapped out for a candy cane or a flag. A few times the ax has been stolen by UA frat boys. He has also been dressed in various costumes and in 2013 he was yarn bombed! Click here to see the photos that I posted when that happened.